This seems more sinister the more I think about it, particularly given that it is by Goebbels, Minister for Popular Enlightenment and Propaganda in Nazi Germany. In fact, this exhibition is filled with objects which seem at first innocuous but become increasingly manipulative and uncomfortable the more you think about them. The exhibition moves from the early origins of propaganda, such as coins with images of Alexander the Great as Heracles, aligning him with the gods, and the early use of the word by the Catholic Church to describe the dissemination of beliefs and practices. Since then, of course, it has become increasingly a negative term, as well as a political practice. The exhibition offers a thorough examination of how to influence, manipulate and subtly alter the views of a population, using everything from the subtle, such as symbolism, in a portrait of Napoleon, for example, to the very overt indeed, such as defamation of one’s enemies. The purposes of propaganda are covered through a range of examples: to encourage support for war, to raise morale, to support or indeed oppose a regime. 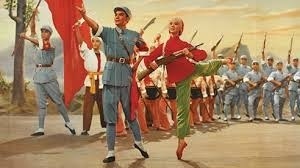 What is particularly interesting is the range of methods for communicating a propagandist message which feature here. Posters and pamphlets one would expect, as well as radio and, more recently, television and films, but there are many more items than I had thought of. Morale-raising scarves from WWII appear, alongside a Boer War board game (a compulsory part of which is singing ‘God Save the Queen’), art, music (Goebbels’ jazz band), monuments, events, sport, science (the ‘space race’) and even a propaganda train, often tied in with the personality cult of political leaders. Of course there is considerable emphasis on the two world wars, and it has to be said that the most effective propagandist material still seems to have been that of Nazi Germany, a chilling fact in itself, but there are many countries covered here, from the UK and Northern Ireland to India, Russia, South Africa, China and Vietnam, to name but a few. It is a cleverly put together exhibition, which makes you think about how we are often unwittingly manipulated, and it serves as an excellent reminder not to take anything at face value. It is weakest, I think, on recent examples; there is a postcard which was dropped on Iraq by the Allies in 2003 and a few other 21st century items, but it does seem to leave the impression that the negative and Orwellian practices of propaganda are mostly behind us, which we know is not true. One of the maxims of good propaganda creation is to build on existing cultural beliefs or mores, and I found it interesting to see the extent to which propaganda of the last century, particularly the American posters, plays on the domestic ideals of home and family as something which must be protected at all costs – not surprising, of course, but the construction of the masculine as defender of all that must be held dear, and the status of women as weak, aligned with children and passively awaiting defence, is one that is of course pervasive and was strengthened by such cultural imagery. While there is, of course, Rosie the Riveter as an example of how turbulent periods may offer change to otherwise static gender roles, Rosie was quickly consigned to history immediately after the war, and though she represented a step forward in the feminist movement it was a while before more women could emulate her apparent strength and freedom. The exhibition, then, encourages us to think about the present as well as to explore the history of the twentieth century through the propaganda it supplied. 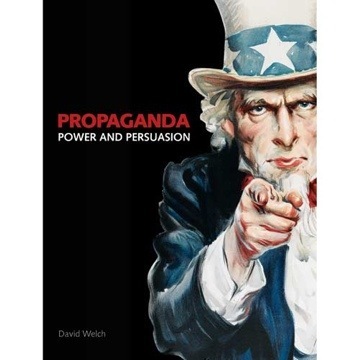 It also raises the important point that propaganda became increasingly necessary in the twentieth century just because it was such a turbulent period, seeing many changes of government and many cultural shifts which needed to be underpinned by propaganda. It makes me think that propaganda is all around us; if not the government then corporations or big brands are trying to influence how we think. Not sure I agree that the exhibition is weak on the twenty-first century. I only spent two hours – but I was captivated by, for example, several video-clips of Alastair Campbell where he thought he was being clever and defending what he did – while the whole exhibition led us to seeing straight through him. There was a short clip of the Thatcher funeral, or David Cameron’s take on it. The Diamond Jubilee featured too. And that’s just to cover the UK! I didn’t buy the catalogue though and so I can’t quote the actual exhibits. In the afternoon, I was still thinking about “Propaganda” when I went to see “Vermeer and Music” at the National Gallery. Now why did the patrons want their houses shown that way, I thought to myself! Yes, perhaps you’re right – the videos etc were interesting and certainly added a lot to the exhibition. And there was the Olympic Opening Ceremony popularity monitor thing, too! Still, there was certainly less focus on the 21st century, and the section entitled ‘Today’ was very sparse compared with the rest of the exhibition. I wondered whether there was anything regarding the Royal Death. That and the Royal baby are, to my mind, recent examples of media manipulation or propaganda that would have us believe that the entire country was mourning or cheering, the idea being that we would forget all our troubles (imposed by those above), and pack them up in an old kit bag. One of the most insidious of the Ministry of Information’s WWII posters was ‘Your Courage, Your Cheerfulness Will Bring Us Victory’ or ‘You Do all the Work and We Will take the Credit’. In the ’90s a friend and I put together a show about life on the Home Front and included this questionable mantra. I’m sure I don’t need to tell you which words we stressed. There was something about Margaret Thatcher’s funeral, I think – just a newspaper cover, but not much else recently. I know what you mean though – that’s really interesting about the WWII posters, and there is such a revival of interest in them at the moment, too.